I hope that everyone is having a very magical Monday! Here is a card that I recently made for a friend who is feeling under the weather. I thought that maybe my favorite "Mouse" would lift her spirits. The Mickey and Minnie rubber stamp is from All Night Media . I colored this cute duo with my Prismacolor pencils and used Mineral Spirits to blend the color. 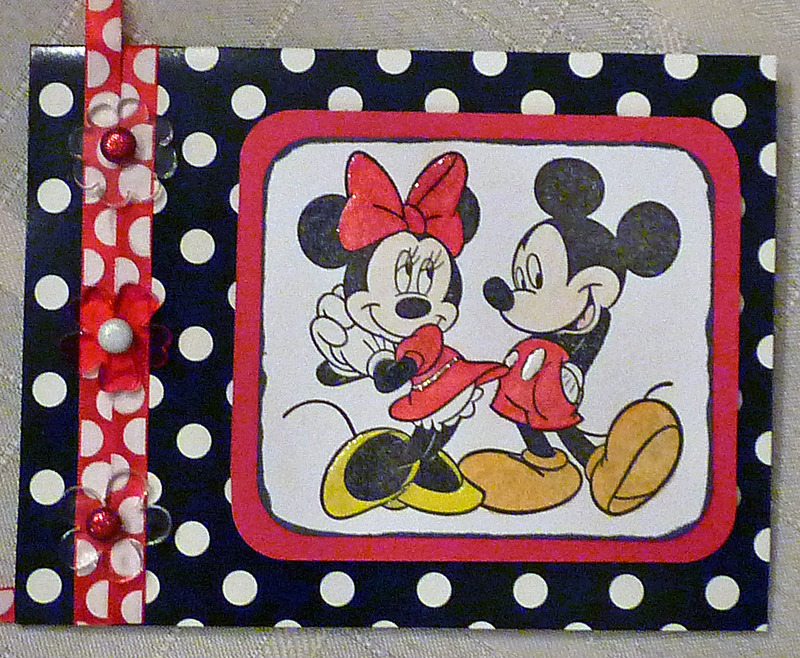 For Mickey's buttons I used white Enamel Accents and Glossy Accents was used on Minnie's bow. Stickles was used on Minnie's dress. I inked the edges of the white card stock with black chalk ink. The ribbon, brads & acrylic flowers were from my stash. The black & white card stock was from the dollar zone at Joanne Fabrics. ( It is actually a plain pre-made card that came in a package of six /complete with envelopes). So there you have it.............the end result was the above card. I hope that you have a MAGICAL week! Thanks so much for stopping by. This came out super cute! You can never go wrong with Mickey and Minnie! Love all the little 'extras' you added to bring everything out! Hugs girl! Cute card! the flowers really give it dimension and added flair. Visiting from Mom's MM.